In our series of articles on interesting facts and pairing ideas, for different types of cheese, the next cheese is Roquefort, which is the oldest and famous blue cheese made in the south of France, considered as one of the great French cheeses having a distinctive and powerful flavor. Roquefort cheese originates from a small village called Roquefort-sur-Soulzon located south of France in the Midi-Pyrénées region. Roquefort is made predominately from the milk of Lacaune sheep although Manech and Basco-Béarnaise breeds are also used. 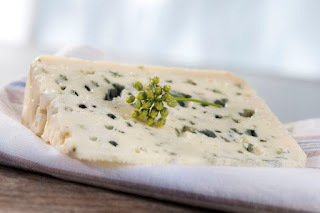 Roquefort cheese is prepared by treating sheep's milk with a special type of bluish-green mold called Penicillium roqueforti, traditionally extracted from loaves of bread that were left to mold in the caves within the Combalou mountains. The process of aging Roquefort cheese is referred to as interior ripening where additional bacteria and mold are introduced during the aging process. A specially harvested bacteria Penicillium roqueforti is injected into the curd, which grows in small fissures in the cheese creating the characteristic blue-green veins and imparting a sharp tangy flavor. In 1411, King Charles VI granted exclusive production rights to the inhabitants of Roquefort-sur-Soulzon, making the caves in the Combalou mountains protected places. To be designated as Roquefort, the cheese must be produced within the Roquefort-sur-Soulzon region in accordance with a number of strict requirements. One of the requirements is the cheese be matured in Combalou caves that have their own ventilation, through natural cracks called fleurines. This ensures that the correct humidity and temperature is maintained in the caves, hence providing good aging conditions for the cheese. Roquefort was the first French cheese to be granted the Appellation d’Origine Contrôlée (AOC) status in 1925. The AOC regulations specify where the cheese can be made along with the standards that must be followed in its preparation, to bear the authentic name. Various studies have found that Roquefort cheese helps protect against cardiovascular disease, improves the health of the digestive tract due to the presence of probiotics and helps promote regenerative processes at the site of inflammation. According to the legend the cheese was accidentally discovered. A young shepherd guarding his sheep was about to have his lunch consisting of bread and cheese when he sighted a beautiful young lady. He left his bread and cheese at the nearby cave, which was damp and cool and followed the lady. He did not have much luck in the pursuit of the lady while also forgetting his hidden lunch. Having returned to the same cave after a few days he found his cheese which had grown a mold from the bread. He had a small bite of it and found the taste very appealing. And thus the blue-veined Roquefort cheese was born. There are seven AOC Roquefort producers in Roquefort-sur-Soulzon. Société Roquefort often referred to as the 'Société des Caves' is the largest producer of Roquefort cheese. The Lactalis Group which is the largest dairy products group in the world is the majority shareholder of Société des Caves. Roquefort cheese has a smooth, creamy, moist texture with blue-green veins and spots from the mold, which give it a pungent flavor, that varies depending on the aging period. The cheese has a distinctive rich, salty, tangy flavor and an aftertaste that is characteristic of blue cheeses. Roquefort is aged for a minimum of 3 months; with aging it acquires a sharper, pungent taste. Roquefort can be paired with fruits, nuts such as almonds, walnuts and hazelnuts, dried fruits, crackers, fresh baguette or mixed with salad topped with walnuts. Roquefort can also be eaten on its own, if you enjoy its complex flavor or with a little touch of honey that creates a salty-sweet combination. To fully enjoy the complex flavors of Roquefort cheese, it should be taken out of the refrigerator at least an hour in advance. Roquefort cheese can be paired with beer, wine or whiskey, but the pairing will depend on the age of the Roquefort. The important aspect of pairing is to achieve balance of flavor, as the cheese should not overpower the drink or the drink should not bury the flavor of the cheese. Roquefort goes well with rich malty beers like nut brown ale, imperial stout and porter as the nut and caramel flavors of the beer complement the cheese. A younger Roquefort cheese which tends to have a slightly more creamy flavor can be paired with an IPA as the bitterness of the hops cuts through the creaminess and richness of the cheese. 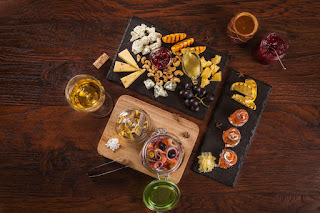 Roquefort and Sauternes is a classic pairing, as the rich, honey, fruit flavors of peaches and apricots of the wine combine well with the salty, tangy flavors of the cheese. Roquefort also goes well with sweet wines like Riesling and ice-wines, besides fortified wines like Tawny Port or a rich oloroso Sherry. A younger Roquefort cheese which tends to have a slightly more creamy flavor can be paired with a Rosé or Sauvignon Blanc which has good fruit flavors and acidity. Roquefort pairs well with peated scotch or whiskey particularly with peaty Islay whiskies. Roquefort also goes well with an aged bourbon as the rich, caramel charred wood flavors of bourbon complement the complex tangy flavors of the cheese.